So is this really climate change or just a lucky break? Two studies recently published in the journal Nature point to the former. 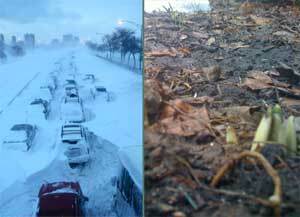 Although focused on “extreme weather events” in the Northern hemisphere rather than extremely nice days in the Midwest, both studies bolster the argument pointing blame at human-generated greenhouse gas (GHG) emissions. The first study focuses the intensity of rain storms and blizzards, analyzing a half century’s-worth of rain gauge data from 6,000 reporting stations run through a variety of climate models. Weirdly, the models taking into account GHGs tend to low-ball the effects compared to actual changes in precipitation tallies. It other words, it’s soggier in real life. Notably, the research doesn’t include data after 1999, which is when a significant number of recording stations were shut down. Yet even when the “best science available” isn’t as good as it might have been, it appears, at least in this case, to have been good enough to raise some major concerns. Still, one wonders whether the missing data could have helped predict this winter’s record snows in Korea, the string of Nor’easters in New England, or the recent megafloods in Germany and Pakistan. And if data from the Southern hemisphere had been included, would we have seen a pattern leading to the catastrophic storms in Australia and Sri Lanka? The second study is, in a sense, much more ambitious: linking a specific weather event—floods in England 11 years ago—to man-mediated global warming. That kind of pin-point precision usually gets lost in climate study footnote caveats that point to variables surrounding any one particular storm. …both models and observations also show changes in the distribution of rainfall, with moisture concentrating in some parts of the world and fleeing from others: climate change is likely to produce both more floods and more droughts. 1) These calculations were made possible by donations of otherwise idle computer time—40,000 years-worth all told. Even in an era of slashed research budgets, there are ways to make enough sense of available data to drive policy decisions (along with, potentially, lawsuits against power companies and insurance rate hikes). 2) We are all already paying the price—literally. Food costs are up by a nearly a third from a year ago, a spike so severe, the World Bank has voiced concern. According to its calculations, 44 million people tipped into poverty due to higher food costs since June, 2010. Other commodities such as cotton are also up dramatically. Manufacturers are reigning in earnings estimates, citing weather-related crop shortfalls. Retailers, including Wal-Mart, are also bracing for the fall-out. The only thing going up is demand as global population continues to increase. 3) Soaring food costs, along with soaring unemployment and decades of repression, are fueling protests across North Africa, with global geopolitical ramifications. Although higher commodity prices should at least be good news for growers, national subsidies have distorted global markets. In Africa, for example, even farmers with high-demand crops such as cotton can find it difficult to eek out a living. All in all, pretty bleak stuff. Except for the one little ray of good news / bad news hope that if the shift in climate is indeed driven by fossil fuel emissions—as a growing mountain of evidence indicates—maybe we can still do something about it. It may be too late to get the climate train back on long-term track, but still possible to slow it down. That’s something. Although several of the biggest companies, led by Coca-Cola, are already well on their way to making the switch, the language in the CGF agreement was softened at the last minute: Instead of requiring members to complete the transition by 2015, they are only required to begin making the transition by 2015. What are they waiting for? Climate change-driven extreme weather is already taking a toll on bottom lines and shareholder confidence. F-gases may only a piece of the puzzle, but a piece that consumer goods companies can take the lead on: “positive change” that’s good for profits, too. In an era of a lot of lose-lose, that’s a rare win-win. NOAA: Another Spring of Major Flooding Likely in North Central U.S.